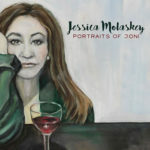 Ghostlight Records has launched a special new label imprint, Ghostlight Deluxe with the latest release from celebrated actress and singer Jessica Molaskey, Portraits of Joni. Ghostlight Deluxe will be curated by John Pizzarelli and Jessica Molaskey. Featuring Molaskey’s distinctly innovative interpretations, this album mixes elements of jazz, pop, folk and Americana into a uniquely powerful and poignant celebration of the iconic songwriter, Joni Mitchell. Portraits of Joni is produced by Jessica Molaskey, with John Pizzarelli serving as co-producer and Rob and Marcie Orley as executive producers. Album guest stars include Jazz luminaries Larry Goldings, Randy Brecker, Harry Allen and John Pizzarelli. Jessica will be performing selections from the album in concert in Seattle (July 27-30), New York (August 8-12), Los Angeles (August 17-20), Santa Cruz (August 26) and Escondido, CA (August 27).